Yeah, I live in one of the most boring geologic landscapes imaginable. California's Central Valley (or Great Valley when we are suffering from low self-esteem) is one of the flattest places in the country, and it's dry and dusty most of the year (and with the extreme drought this year, it's been dusty for more than a year). Our geology is basically clay mixed with sand. And some caliche layers. How much bleaker can it get? Well, how about the trees? Tangled chaotic woodlands that hobbits and elves would avoid. Broken branches, barren of leaves, what is there to love here? And once you leave the confines of the river floodplains there is not even enough water to support brush let alone trees. Flat grassland plains that reach to the horizon. Okay, it's true that the origin of the Great Valley is rooted in geological violence. The valley is the remnant of a gigantic forearc basin that lay between the trench of the great Cascadia subduction zone and the Sierra Nevada magmatic arc. Volcanic eruptions once coated the region in thick ash layers, and intense earthquakes 30 times more powerful than the San Francisco earthquake of 1906 happened tens of thousands of times over millions of years. But now. Nothingness. So, I ask who could love such a place? Well, it's for the birds. For them, this bleak environment is survival. As I have mentioned in recent posts, 95% of the original natural environment of the Great Valley has been co-opted for agricultural and urban development. 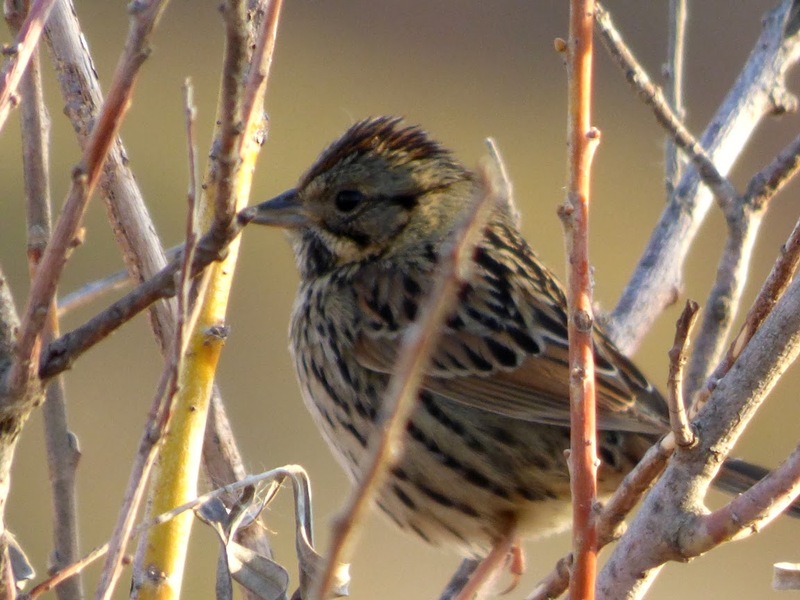 Millions upon millions of birds once used the valley as a wintering ground or for critical food-gathering during their migrations elsewhere. 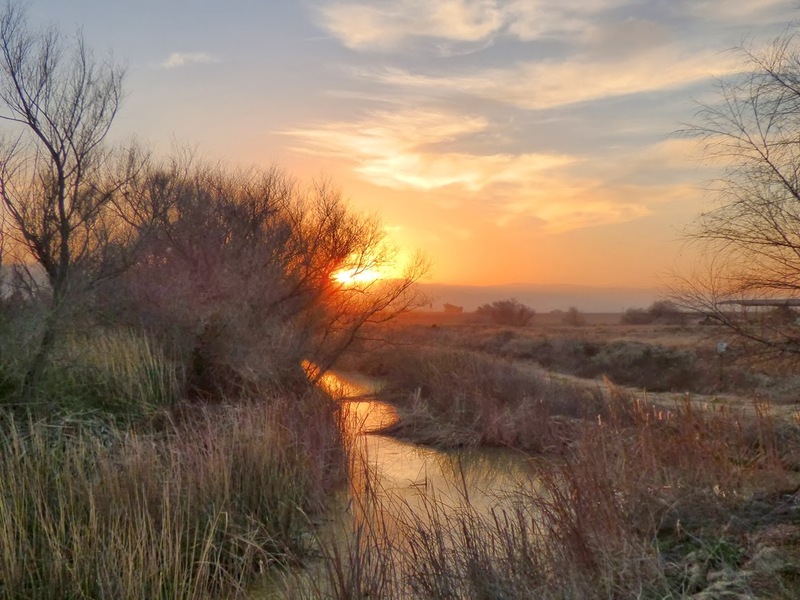 This week I was continuing my for-the-first-time exploration of one of the most spectacular displays of nature by paying visits to the San Joaquin River National Wildlife Refuge. I'm still sort of stunned that this has been in my own backyard, but was so easy to overlook (I should add that I never learned to surf despite living in Santa Barbara at one time, and never learned to ski despite living next to Lake Tahoe for a time; I just sorta miss stuff). 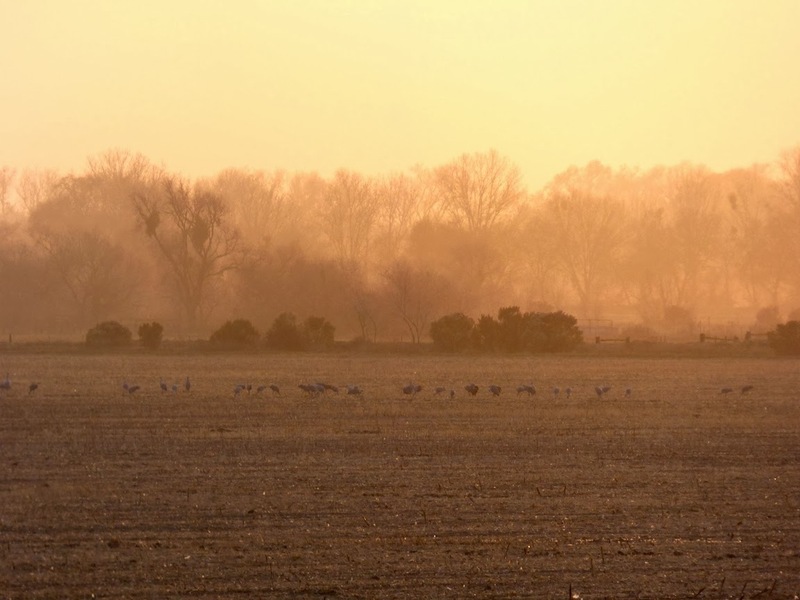 Like the San Luis and Merced refuges, The San Joaquin River NWR provides year-round habitat for the local native species (not just the birds), but in winter it is home for thousands upon thousands of Snow Geese, Ross's Geese, Aleutian Cackling Geese, Sandhill Cranes and many others. The San Joaquin River NWR is notable for the role it has played in the recovery of the Aleutian Cackling Geese, a species that was down to around 300 individuals in 1963 (foxes had been introduced on the islands where they nested). Many of them winter at San Joaquin, and in recent years they have numbered in the tens of thousands. 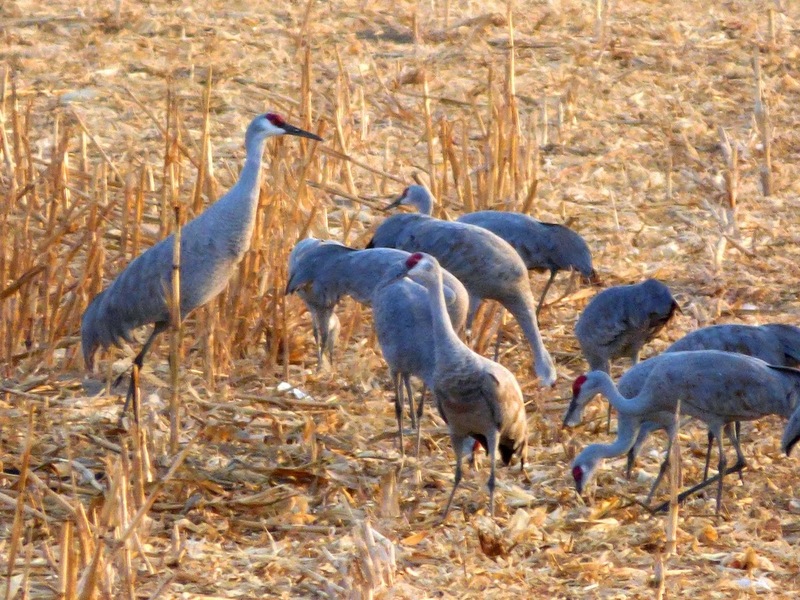 Thousands of Sandhill Cranes can also be found there. 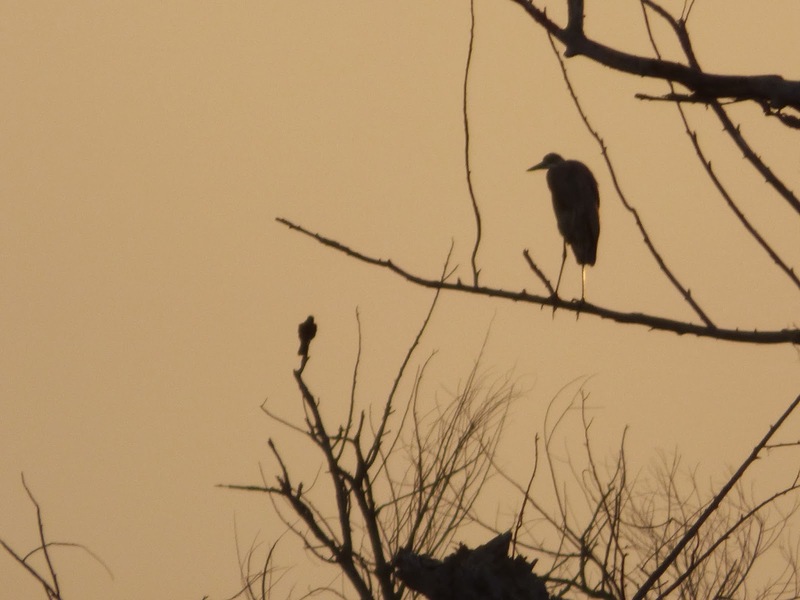 There are two main ways to explore the San Joaquin River NWR. 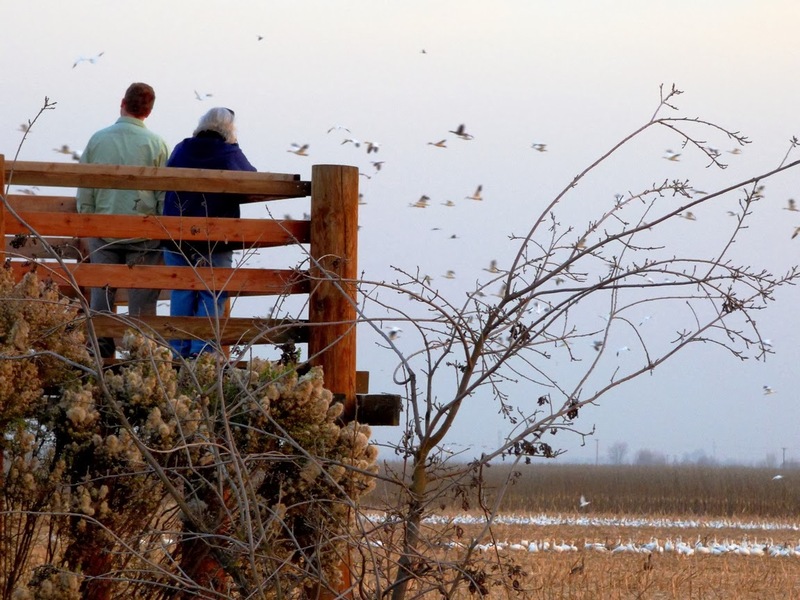 There is a wildlife viewing platform on Beckwith Road about 8 miles west of Modesto. It makes absolute sense that people wouldn't be allowed to tramp all over the fields where the birds eat and roost, so the platform offers a high viewing point, and when I was there, thousands of birds were visible. Mrs. Geotripper was kind enough to make her video available of thousands of birds swarming around the plowed corn crops that were grown to feed the birds. 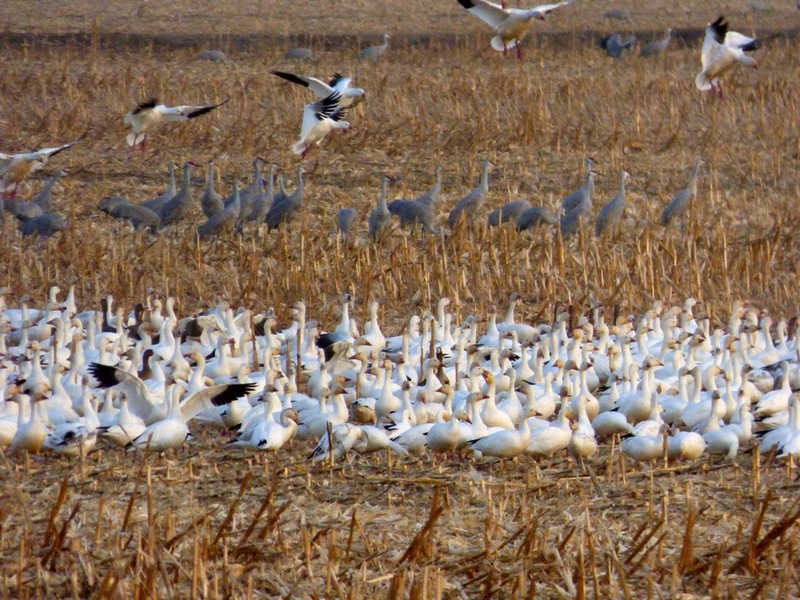 It may recall the incredible flight of the Snow Geese at the Merced NWRI posted the other day. Our other exploration was much quieter and intimate. South of Highway 132 and off of River Road and Dairy Road, there is a recently constructed foot trail that winds through 4 miles of fields and river woodlands. The seasonal wetland had not been flooded yet (if it will be at all, given the drought), so the vast flocks of migratory birds weren't present. On the other hand, we had a chance to seek out the resident year-round species. The caretakers of the refuge are in the process of reconstructing and rebuilding the habitat that existed prior to settlement by Europeans in the 1800s. 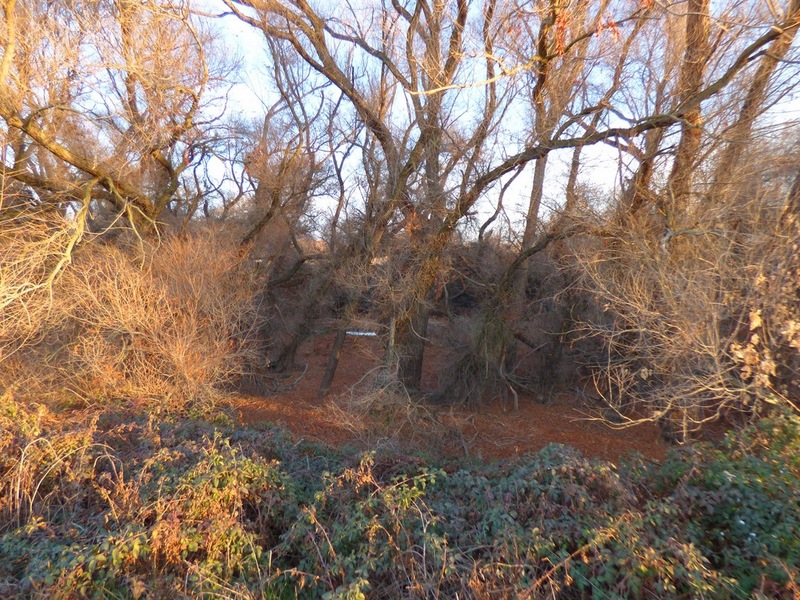 Floodplains and riparian woodlands are being replanted with tens of thousands of trees, and former wetlands are being flooded regularly in an effort to reproduce seasonal flooding that took place prior to agricultural development. The squarish property/refuge boundaries and canals belie a complete return to a natural environment, but it is a richer environment than existed before. A Song Sparrow (Melospiza melodia), perhaps? 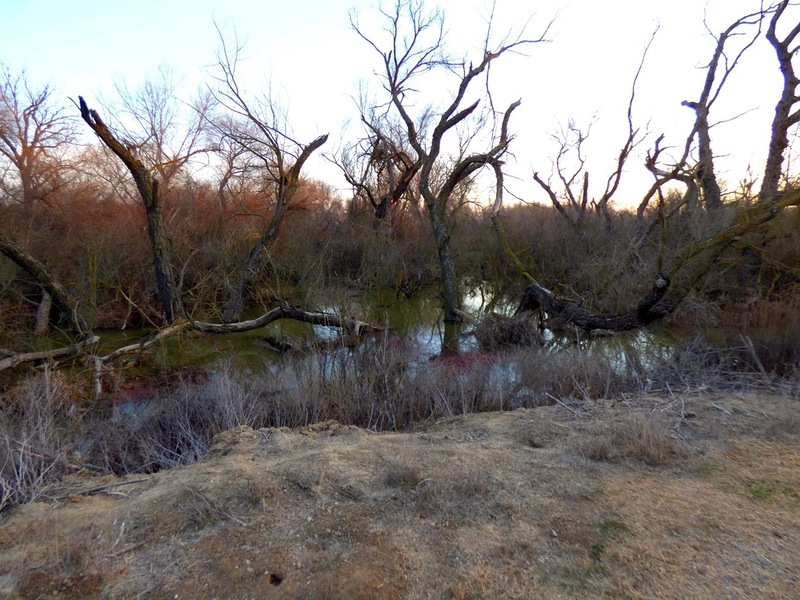 We only had a short time to explore, covering only a mile of trail, and we didn't quite reach the section of the trail that parallels the San Joaquin River. 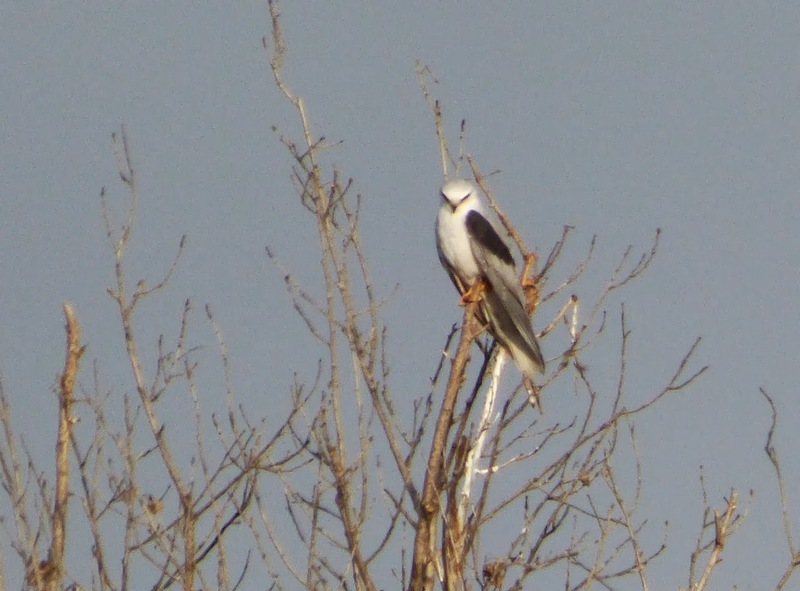 A fair number of bird species were present, and a few allowed us to snap a few shots before they hopped into the underbrush. 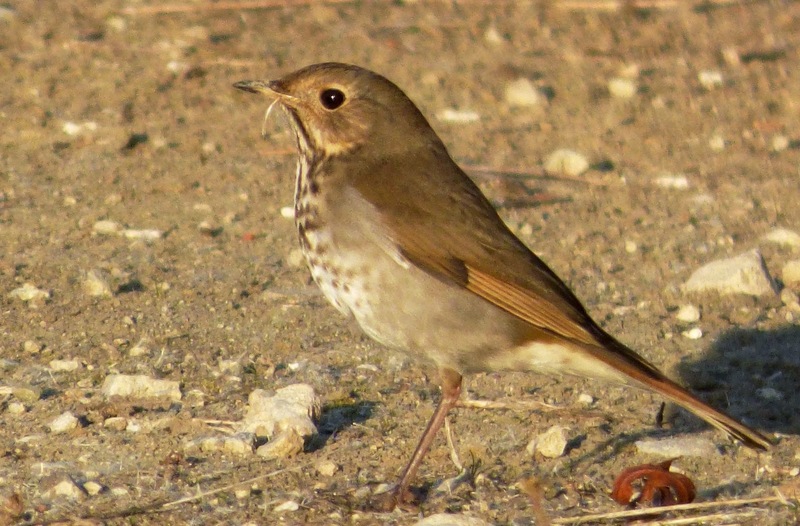 Being a rank amateur in the birding business, this was the first time I've ever identified a Hermit Thrush. Some people may have hundreds of birds on their life lists, but at least, I have an easier time adding new birds! A gentleman at the wildlife platform on Beckwith told us that dozens or hundreds of birders came out a few weeks back when someone spotted a rare Bunting species next to the platform. Some folks came from out-of-state for the chance to see it. We didn't arrive until around four o'clock in the afternoon, so the sun was sinking fast as we made our way back to the parking lot walking atop the levee that protects some of the regional farmlands from flooding. A thicket of trees and brush kept us from seeing very far, but the chirping and hooting told us that numerous birds were hiding there. 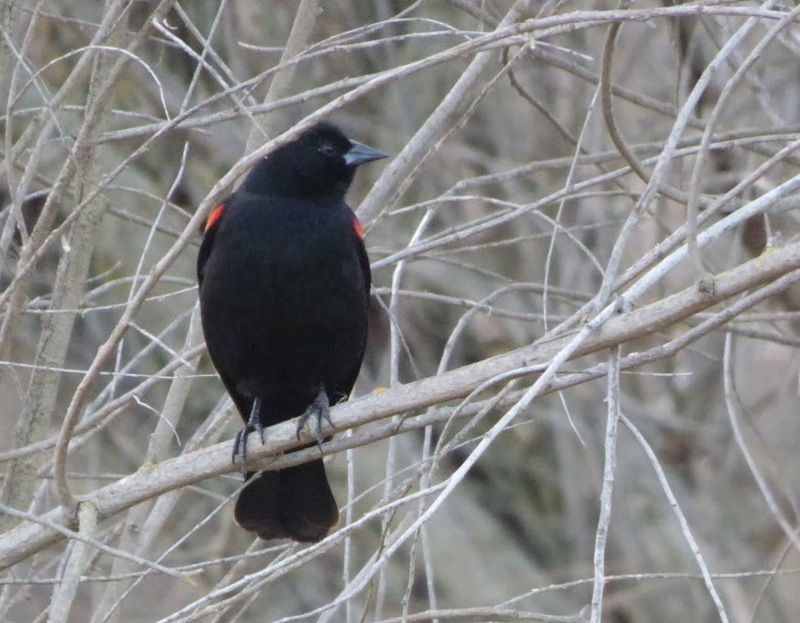 One last Redwing Blackbird greeted us as we got back to the car and headed home. 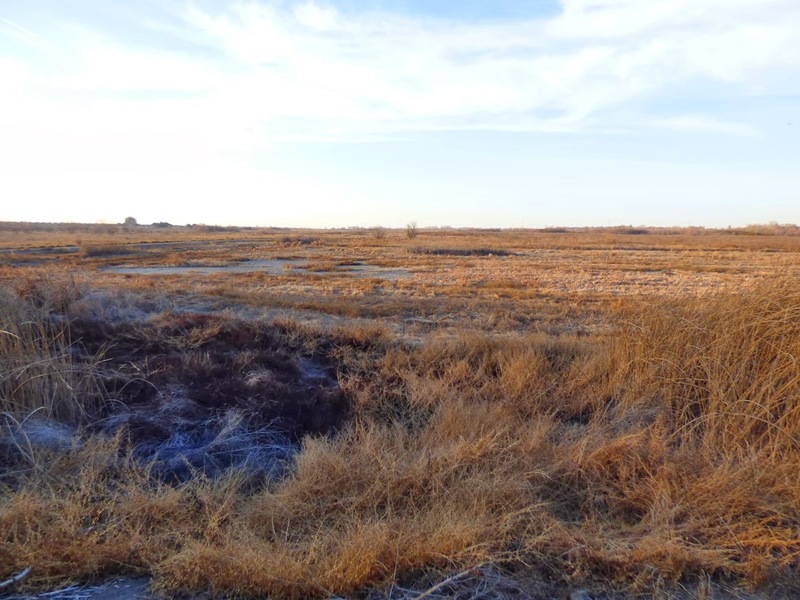 The San Joaquin River National Wildlife Refuge will be on our list for further exploration if the rains ever come and replenish the grasslands! Great shots! Our WildLink kids played a role in replanting part of the SJNWR two years ago. Looking to finish part two soon. The last photo of the sun setting is just beautiful. Thanks for sharing. I was working just these last few weeks with River Partners on their Dos Rios project, and in the very same Refuge you refer to here. The birds were amazing, the Coast Range, watching Wednesday's storm break up into Thursday's sun, all highlights. Beautiful place where there are some amazing efforts, in my opinion, taking place to attempt to save our valley by returning it to nature. I am a long time reader, just checking in, and was excited to read about this effort here on your blog Garry. Nice.